Aesthetics is an area of philosophy sometimes taken to be synonymous with the philosophy of art. This, however, is a mistake. Although aesthetics is for the most part concerned with questions concerning the nature of art, it also addresses more general questions of beauty. In this session we will look firstly at beauty before going on to examine the nature of art. In aesthetics there are contrasting views on the nature of beauty, which can be divided into Objectivist and Subjectivism. Thus, as with questions concerning the nature of morality in ethics, the objectivist will point to something ‘out there’, some objective property of the world which exists independently of human apprehension. The subjectivist, on the contrary, will explain beauty with reference to our reactions to the world around us. This is sometimes expressed in terms of the view that ‘beauty is in the eye of the beholder’. In order to help us think about this issue, consider Brigitte Bardot, a Scottish landscape, Van Gogh’s Starry Night, and a rose. These are all example of things which most would be willing to call beautiful [I realise I’m on shaky ground here with Bardot]. So, what do they have in common? A subjectivist could say that what they have in common is that we are all prone to react to them in the same way – as beautiful things. This might also explain why some of us may disagree over whether Bardot’s face or Van Gogh’s work is really beautiful – we just feel differently about it. A philosopher who holds this view of beauty is David Hume. This should come as little surprise given his thoughts on morality (Emotivism). In his ‘Of the Standard of Taste’ (1759) Hume states that, ‘Beauty is no quality in things themselves: It exists merely in the mind which contemplates; and each mind perceives a different beauty. One person may perceive deformity, where another is sensible of beauty’. Hume does not, however, believe that this entails ‘beauty is in the eye of the beholder’. Although beauty is a subjective quality, Hume thinks there is nevertheless a standard by which to discern between different tastes. Some great works of art, for example, will have such universal assent across time and cultures that their status as such will be unquestionable. Furthermore, if there are disagreements about such matters we are to acquiesce to the ‘good critic’ who will have ‘strong sense, united to delicate sentiment, improved by practice, perfected by comparison, and cleared of all prejudice.’ Some may see this as an elitist position, that we must defer to those who ‘know better’. It is also possible to see Hume’s ‘good critic’ as comparable to Aristotle’s virtuous man. As such, the beauty which we experience in the real world is only a poor representation of Beauty itself, which exists absolutely, objectively, and independently in the world of Forms. For Plato, the Form of Beauty is only accessible to the philosopher through reason alone. This may seem somewhat peculiar; how is it that we can discover beauty without the use of the senses? It may help to consider Pythogoras’ views here. Pythagoras thought that there was, in mathematics, a perfect ratio which, whenever and wherever found, expressed harmony and beauty. This ratio has come to be known as the Golden Mean and is found throughout the universe in natural objects, music and harmonics, and in art. The Golden Mean, as a mathematical concept, may provide an insight into the Platonic view that Beauty is discoverable by reason alone yet is instantiated, to a greater or lesser degree, in the world of appearance. Let us next move on to the issue of Art. There are four main theories of art that I would like us to consider in class these are: the Representational theory; Expressionalism; Formalism, and; the Institutional Theory. Representational Theory, as the name suggests, considers art as an attempt to successfully re-present other parts of the world. 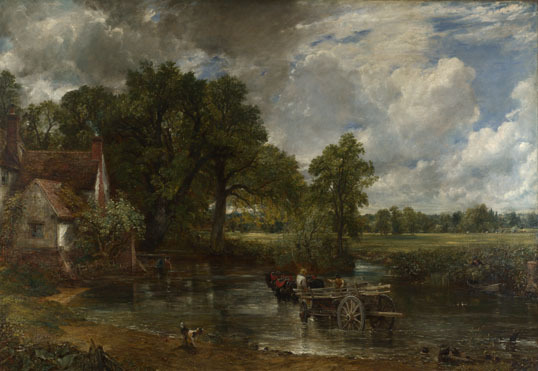 Hence, Constable’s Haywain (1821, above) is successful inasmuch as it manages to accurately reproduce the scene it depicts. This sort of representational view of art seems to have been the view held by Plato (mimesis), who believed that artists should be banned from his Republic. As we have already seen, Plato’s view is that the things in this world – the world of appearance – are actually just poor representation of the Forms. As such, art is no better than a representation of a representation – even further removed from Reality and Truth. 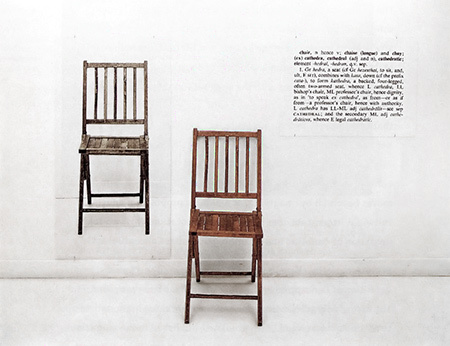 Joseph Kosuth’s One and Three Chairs (1965, below) may be thought of in terms of this relationship between the Forms, their worldly counterparts, and artistic representations. Undoubtedly, a further reason that Plato demanded the censorship of art is the ability that it has to affect our emotions. Aristotle, however, disagreed. For Plato, as you know, emotion is undesirable; to be controlled (kept in check) by reason. Aristotle actually believed that such things as tragedies were desirable exactly because of the emotional reaction we have to them, which allows us to purge our emotions in a controlled environment. This is known as his theory of Catharsis, which helps us to account for the apparent paradox in our enjoyment of tragic art/ horror/ etc. One thing which I believe Plato’s is mistaken about in his view of art, is that it provides us with mere representations of the world. Couldn’t it be rather that artists can take us closer to the Forms (on Plato’s own account) by transcending the world of appearances. What is certainly clear is that not all art is representational in its nature. The activity of art is based on the fact that a man, receiving through his sense of hearing or sight another man’s expression of feeling, is capable of experiencing the emotion which moved the man who expressed it. To take the simplest example; one man laughs, and another who hears becomes merry; or a man weeps, and another who hears feels sorrow… and it is upon this capacity of man to receive another man’s expression of feeling and experience those feelings himself, that the activity of art is based. 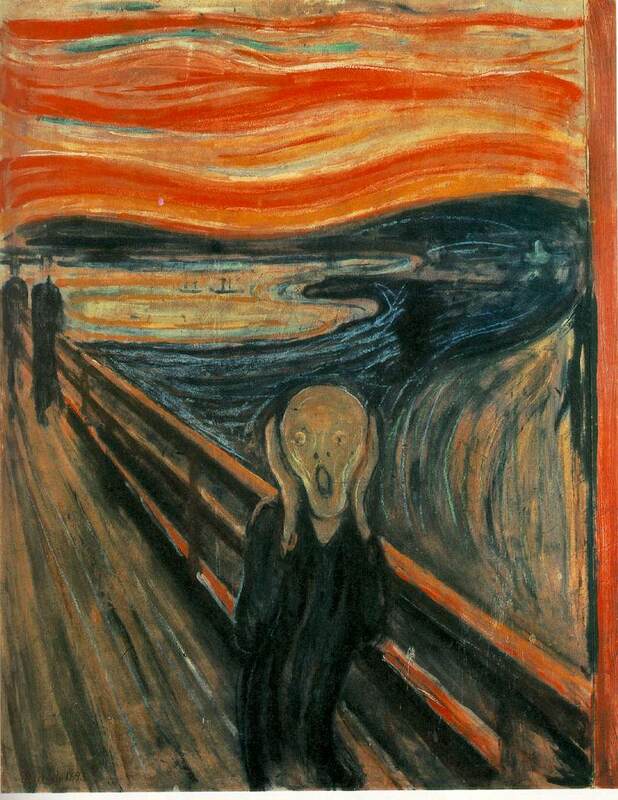 The late nineteenth and early twentieth centuries were dominated by the expressionistic art of Munch, van Gogh, Schiele, Dali, Matisse, Picasso, Gaugauin, et al. Tellingly, this period coincided with the burgeoning of photography and film which, arguably, freed the plastic arts from their representational basis. There must be some one quality without which a work of art cannot exist; possessing which, in the least degree, no work is altogether worthless. What is this quality? What quality is shared by all objects that provoke our aesthetic emotions? What quality is common to Sta. Sophia and the windows at Chartres, Mexican sculpture, a Persian bowl , Chinese carpets, Giotto ‘s frescoes at Padua, and the masterpieces of Poussin, Piero della Francesca, and Cezanne? Only one answer seems possible – significant form. In each, lines and colours combined in a particular way, certain forms and relations of forms, stir our aesthetic emotions. These relations and combinations of lines and colours, these aesthetically moving forms, I call “Significant Form”; and “Significant form” is the one quality common to all works of visual art. 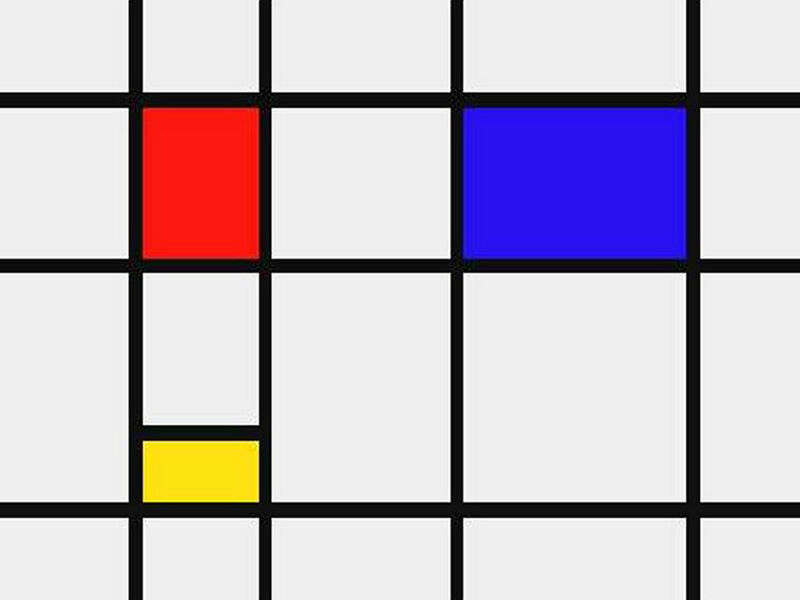 Whilst Bell’s ‘significant form’ can perhaps explain why we appreciate art such as the Mondrian above, it is clear that it is unable to account for much of what we now consider Contemporary Art. Neither, it seems can we say that such art is a representation (Tracey Emin’s My Bed 1998 is, after all, a real bed). While we might be able to say that the ‘bed’ expresses some inner state of the artist can we really hold that a shark in formaldehyde (Damien Hirst, 1992), a collection of Brillo boxes (Warhol, 1964) or a urinal, entitled Fountain (Duchamp, 1917) really expresses anything? ‘They were asking me questions like: “is it art?” And I was saying “Well, if it isn’t art… what the hell is it doing in an art gallery and why are people coming to look at it?”.